So you want to learn self-defence, enhance your self-confidence, and improve general fitness, and flexibility? Then Taekwondo is a great choice! Taekwondo will help you achieve increased self-esteem, integrity, and discipline in all ages. You will gain a comprehensive knowledge of the World Taekwondo Federation (WTF) style through an enjoyable and rewarding syllabus instructed the traditional Korean way. At Dujon Taekwondo, we devote ourselves providing quality traditional martial arts instruction to all of our students. We place a strong emphasis on improving our mind and body the Taekwondo way. You’ll enjoy the training, it’s fast, fun and a full Olympic martial art sport which enables students to progress in competition sparring, pattern-work, and self-defence. You will progress through the belts in no time! 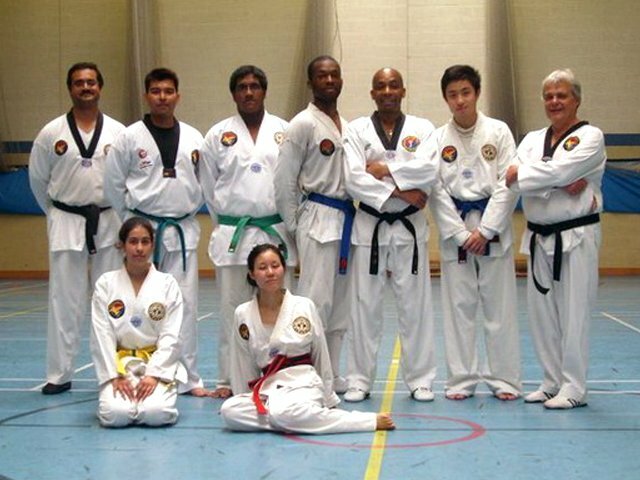 Dujon Taekwondo was founded by Mr Dujon (5th Dan). Korean trained instructor with over fifteen years experience of teaching traditional Korean Tae-kwon-do. Trained by Master Han (8th Dan), Mr Dujon has been a practitioner of the martial art of Tae Kwon Do for over thirty years. Taekwondo (also spelled Tae Kwon Do or Taekwon-Do) is the Korean national sport. It is also one of the world’s most commonly practised sports. The World Taekwondo Federation’s (WTF) style is the only recognised form of Taekwondo in the Olympics. Taekwondo literally means “the way of the foot and first” because Tae means “to destroy with the feet”, Kwon is “to strike” and Do is “path” or “way”. Copyright © 2019 Dujon Taekwondo.